Are you offering a greeter training? Are you a greeter volunteer looking for some first steps in your new role? 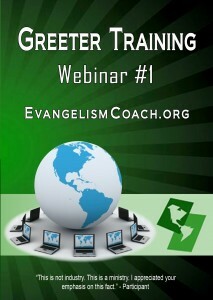 Churches should offer greeter training every now and then and you might be looking for a powerpoint training to share. How do I show hospitality to people after the service? How do I reach out to visitors? How do we get guests to come back? They might be too nervous to ask you directly. How to I get greeters to remain available throughout the Sunday morning services? How do I train and inspire new volunteers? How do we get visitor contact information? How do I get greeters to be visitor sensitive (instead of talking with their own friends). How do I put all the pieces together for a hospitality system? How do we get more friendly greeters? First time greeters and Ushers. Potential Greeter and Usher Volunteers. Hospitality ministry organizers who want a review. to help you give that last minute training. Sharpen your own skills to greet. Receive a fresh vision for effective greeting. Overcome the awkwardness some new greeters feel. If you are a greeter volunteer, or even the organizer of your greeting ministry, this training is a quick way to get into the swing of things. The class had lots of good, practical advice, some of which we do already. But it will help us fine tune our training etc. and get across that Greeting is a ministry, not just a job for a warm body. The class was well organized, I thought. It was very informative. I liked having the study sheets, too. Thank you for doing this, it was very helpful. I want to do some training for our hospitality desks and our greeters, and have been looking for some materials to help! I did get some great notes to take back to my next greeter’s meeting and I thought the powerpoint presentation was very well organized and informative. I am hoping that on your next presentation some of our greeters will be able to join in. Thank you. I enjoyed the Webinar very much and feel charged up, excited and ready to go this Fall. This is the second Webinar I took from Pastor Chris and I will continue to take them as he makes them available. I’m also going to be purchasing his written materials as I’m sure they will be useful as we grow our Hospitality Ministry. Thank you so much Pastor Chris,the telecast was excellent. You’ve given me alot of information to use in my training of new greeters. The webinar last night was a good “review” for me. I have studied your works and that of others in the past, so it was more of a review for me, but that was good. Thank you, Chris, for the seminar. It was definitely worth my time. I appreciated the advance notes. You covered the topic well. This is not industry. This is a ministry. I appreciated your emphasis on this fact. I liked your presentation; I took notes which will help me in working with our greeter ministry. Thank you for sharing your compassion, experiences and wisdom with us! I have the desire to make our visitors feel loved, comfortable and equally a part of our worship so I welcome all the help I can receive. You always present your material in a way I can comprehend and “user friendly”. I really appreciated the emphasis on greeting being a ministry, not just being friendly. Thank you for sharing your experiences and what you have learned in the years you have been involved in greeting ministries at churches.